they own the ICC - which now resides in Dubai, not Lords - so it's unlikely. No wonder it's going down the shitter. Strange as this comment may be though, for me Symo has a lot to answer for. I like the guy. I think he is a great cricketer. He makes me laugh when I see him interviewed. His off field support of breast cancer is second to none. But I don't think he is good for the game. He effectively ended Bucknley's career on day 2 of a test. ^ Is that the Twenty20 game mate? nah feb 10 i think which is a standard 1 day match. Bunch of moaning fcuking pussies.They complain about sledging,yet they were/are the worlds best.Why does a team,that has such outstanding criceting ability, now point the finger like they are always right and never wrong. I call it arrogance to the max.The fcukers should be playing womans soccer. big difference between some (admittedly sometimes quite harsh sledging) and racial vilification. If the Indians go home, they should lose their test status. Simple really. If they're too immature to play with the big boys they shouldn't be allowed to play with the big boys. agreed. fckn lala boys, worse than bladdy thai's IMO. As for losing it, they own the ICC - which now resides in Dubai, not Lords - so it's unlikely. ^what makes me laugh is that some of the Aussie players (if not all) could be in breach of their ACB contracts if they go play the Twenty20 in India in April - this must be making them rethink. The following is the full statement from the Board of Control for Cricket in India into the decision to ban their spinner for three matches for making a racist remark. The Board of Control for Cricket in India has viewed the happenings during the second cricket Test between India and Australia in Sydney with great concern as some of these can have a far-reaching impact on international cricket. Some of incidents are highly regrettable considering the warm and friendly relations between the Indian and Australian cricket boards. The incident involving Indian off-spinner Harbhajan Singh and Australian all-rounder Andrew Symonds and the subsequent hearing by the ICC match referee and his conclusions are, to say the least, distressing. The Indian Board does not accept the findings of the match referee and has decided to challenge the unfair decision to suspend Harbhajan Singh as it deems it patently unfair. The Board will appeal to the International Cricket Council to review the decision of the match referee and suspend its operation till the appeal is disposed of. The Indian Board realizes the game of cricket is paramount but so too is the honour of the Indian team and for that matter every Indian. To vindicate its position, the Board will fight the blatantly false and unfair slur on an Indian player. The Board also questions the very conduct of the hearing as the match referee before reaching his decision disregarded the essential point of any inquiry, that it should be based on facts, rational, detached and objective. The Board, in particular, is unhappy with the charge of racial slur against India's of-spinner Harbhajan Singh. India have suspended their cricket tour of Australia pending the outcome of an appeal against a three-match ban handed to spin bowler Harbhajan Singh. The Board of Control for Cricket in India (BCCI) has told its players to stay in Sydney rather than travel to Canberra for a tour match on Thursday. Harbhajan was banned for making a racist remark during their tempestuous defeat to Australia in the second Test. He was found guilty of breaching the players' code of conduct. The International Cricket Council held a four-hour hearing after the Test finished on Sunday, finally announcing their verdict deep into the night in Australia. Australia's players had claimed that Harbhajan called Australia's Andrew Symonds a "monkey" during an on-field incident. Match referee Mike Procter said he was satisfied Harbhajan had used the word - though neither of the two umpires heard the remarks - and that "he meant it to offend on the basis of Symonds' race or ethnic origin". All-rounder Symonds, 32, is the only non-white player in the Australian side. Well it seems as if the tour has been cancelled.....for now. Bloody nancy pannsies sooky lala indians. One thing I can't understand is that this is mainly an issue between the indians and the umpires yet the aussies seem to have been dragged into it and been made to look like the bad blokes. realizes the game of cricket is paramount but so too is the honour of the Indian team and for that matter every Indian. fight the blatantly false and unfair slur on an Indian player. ..........in particular, is unhappy with the charge of racial slur against India's of-spinner Harbhajan Singh. ??? because an indian player could not possibly be racist?? the very conduct of the hearing as the match referee before reaching his decision disregarded the essential point of any inquiry, that it should be based on facts, rational, detached and objective. really?? like the Board of Control for Cricket in India do ?? The tourists have argued Harbhajan's hearing was a case of the word of the Indian players against that of the Australians. In such a situation, they believe the spinner should not have been found guilty. Interesting situation.... who to believe? and acutally, the bladdy Indians have themselves to blame for this mess for not addressing the problem during Australias tour to India a little while ago anyway! I agree with their complaint, 3 match ban for something no one has any proof of is stupid. To cancel their tour is downright, inexcusable and childish. Most of the respect I did have for them is already gone but if they follow through with their threat I will treat them contempt for the rest of my life. One things for sure- the Umpiring at Sydney was absolutely abysmal, and unfortunately the bad decisions went against India, which just adds fuel to the fire. Some changes needed methinks. "India have been dudded. No one with the slightest enthusiasm for cricket will take the least satisfaction from the victory secured by the local team ... It was a match that will have been relished only by rabid nationalists and others for whom victory and vengeance are the sole reasons for playing sport. Truth to tell, the last day was as bad as the first. It was a rotten contest that singularly failed to elevate the spirit." interesting article here regarding where the power lies. i think the Indian cricket board is flexing some muscles. India's cricket world is awash with money providing big temptations for players and selectors. Now an audacious media magnate with his eye on the Twenty20 prize wants to cash in. By Ian Chappell. There's no doubt India has the financial clout and player numbers to be a permanent powerhouse in world cricket. The fact that this isn't the case is best summed up by the locals' description of their cricket board: "The BCCI is not in the cricket business, it's in the business of making money." Lately, they've been very successful at their business. The Board of Control for Cricket in India predicts revenue of about $US181m ($208m) for 2007-08, compared with revenue of $US9.85m in 1996-97. India is also responsible for about 70&#37; of the International Cricket Council's (ICC) income from television rights and sponsorship. But in an era where they've enjoyed a dream batting line-up consisting of the little master Sachin Tendulkar, run machine Rahul Dravid and the sublime talents of Sourav Ganguly, V.V.S. Laxman and Virender Sehwag, India has managed to win only 23% of its major overseas Tests. A classic case of wealth and winning not necessarily going hand in hand. Many Indian players have also become enormously wealthy, but this often leads to unwanted distractions for both the team and individuals. In 2001 Tendulkar signed a contract with television entrepreneur Mark Mascarenhas, giving him $US20m from endorsements over a five-year period. There is a downside to such riches. To avoid being mobbed, Tendulkar has to drive his sports car in the early mornings and when going to the movies he wears a disguise. And spare a thought for the humble Indian selectors. They only receive expense money, but have to judge millionaire star players. Then there are the players' sponsors; they pay big bucks but only get a full return if "their man" is in the team. Consequently, selection is not always a straightforward matter of form and easing out ageing stars can be difficult, as my brother Greg discovered when he tried to have Ganguly replaced as captain. The system lends itself to corruption and powerbroking. In a country described as the "most commercial" in the world, it's amazing how few paid officials there are in Indian cricket. Such a heavy reliance on amateurs might be viewed as glorious self-sacrifice for the love of the game, but it's often an opportunity to attain power or riches through holding an office of influence. Domestic players desperate for recognition are known to have offered money or favours to be selected in their regional team. Even at the national level, selection is often based on regional favouritism rather than ability. "You vote for my man and I'll vote for yours" doesn't happen only in India, but a selector who consistently gets players from his region into the national team is certain to be voted back in - and power can become a form of currency. Then there's the pressure of an ever-expanding media competing for a slice of a fanatical audience. This turns up the heat on selectors and officials. There are many fans of India's star cricketers, as distinct from actual followers of the game or a team. There's a notable difference between the average Indian and Australian cricket fan. If India loses but Tendulkar makes a century, most go home delirious. If Australia loses and Ricky Ponting makes a ton, many fans go home and kick the cat. While the BCCI's bulging balance sheet hasn't automatically produced on-field supremacy, India's financial strength does provide international clout and leaves the ICC in an extremely vulnerable position. The ICC has always been more adept at politicking and powerbroking than administration, and in the past decade these failings have been magnified by their reliance on India's enormous financial input. Through a combination of financial power and past favours granted, of the 10 major nations India is almost guaranteed the support of Pakistan, Sri Lanka, the West Indies, South Africa, Bangladesh and Zimbabwe when the ICC votes. This often leads to poor decisions, with the unconscionable mishandling of Zimbabwe's playing status and a rapacious over-crowding of the playing schedule being classic examples. Indian cricket wasn't always a money-making machine and there was less demand on players to perform. Former captain Sunil Gavaskar remembers some players being more interested in the prestige of winning a cap rather than matches. He tells of one Indian batsman who scored heavily against the state sides and was in line to be chosen for a Test against Australia, with Jeff Thomson leading their attack. When given the seemingly good news of his selection, he looked incredulous and asked: "Why me?" However, thanks to strong-minded players like Gavaskar, Kapil Dev, Gundappa Vishwanath, Mohinder Amarnath and Ravi Shastri, India gradually added steel to their undoubted skill. They went from a team who mixed equal flashes of brilliance with spectacular collapses to a strong competitive unit. The change in attitude resulted in an upset win over the West Indies in the 1983 World Cup final, a victory that changed the perception of the one-day game in India. Suddenly the shorter version of the game was in demand and eventually this led to a major change in India's cricketing fortunes. While many players were responsible for the increased respect accorded Indian teams on the field, the BCCI has only one man to thank for setting it on the path to financial security: the board's former president, Jagmohan Dalmiya. Dalmiya guided the organisation of the successful 1996 World Cup and from that tournament India received the previously unheard-of sum of $US40m. He then performed a similar monetary miracle for the ICC after being appointed president in 1997. Former BCCI secretary J.Y. Lele gives an insight into the parlous state of the international body's finances at the time. In early 1997, Lele says, he got a call from ICC chief executive David Richards asking for India's annual affiliation fee of $US15,000. Lele wondered why Richards was asking when the fee wasn't due until April. Richards admitted the ICC needed the money early to pay employees' salaries. Lele then phoned Dalmiya, the ICC president. Dalmiya gave Lele permission to make the payment, but also said that he would not let such a shortage of funds be repeated. Dalmiya then asked Richards to call an executive board meeting where he spoke about the ICC knockout tournament, which was held the next year in Dhaka. Now known as The Champions Trophy, the first tournament was a resounding success. Boosted by substantial television rights from the subcontinent and sponsors with a huge investment in India, the ICC return was around $US18m. This was India's first big contribution to world cricket's coffers and, as the percentage has continued to rise, so has their power at the ICC. The 1996 World Cup coincided with an explosion in the number of pay television channels in India, which has had in mixed repercussions for the BCCI. In a country where cricket and commercialism are wed, there have been many financially beneficial but sordid battles for television rights in India. Beginning with the 2003 World Cup rights, businessman Subhash Chandra, the man who launched the country's satellite television revolution, made a number of bids for cricket telecast rights. He eventually tired of the BCCI's rebuffs and in April this year formed the Indian Cricket League (ICL), beginning with a Twenty20 tournament to be televised on his own Zee TV. His decision to take on the BCCI is reminiscent of Kerry Packer's World Series Cricket revolution in 1977. Like Packer (who was angered by the Australian Cricket Board's antiquated approach to cricket telecast rights), Chandra began signing up players - a few ex-internationals but mostly Indian domestic cricketers - for his own league. The BCCI immediately banned any player who joined the ICL from all forms of traditional cricket and then, in September, they announced their own Indian Premier League (IPL). This is a two-tiered Twenty20 competition involving a domestic Indian league, with the winner then playing the champions from Australia, England and South Africa. Shane Warne and Glenn McGrath have signed, as have Ricky Ponting and Brett Lee. The BCCI has already spent about $US2m recruiting players from Australia and, with cricketers from other countries, they will be integrated into the local competition. The BCCI has promised that national teams will take priority after warnings by Cricket Australia chief executive James Sutherland at the weekend that CA-contracted players should not sign with IPL until some contractual issues were resolved. IPL's pre-emptive strike appears to have unsettled the ICL. Their competition was due to start in October but was postponed until the second week in November, and a further delay now has it clashing with the current high--rating India versus Pakistan Test series. It will be a pity if the ICL's initiative doesn't have a positive impact on Indian cricket, because they've put forward some good ideas. All teams have ex-players as mentors and the officials will be paid, so it's a merit system rather than the BCCI's haphazard structure, which relies more on length of service or who you know rather than what you achieve. Incorporating some ICL ideas into the BCCI set-up shouldn't prompt any conscience pangs because, as a local TV executive told me: "Ian, copyright in India means the right to copy." Since the threat of the ICL loomed, the BCCI has more than doubled the average domestic player's wage and prizemoney has soared. The irony is that many provincial cricketers happily signed with the ICL because some state associations didn't honour their payments to players. The IPL concept is basically a knee-jerk reaction to a predator, put together in haste and underwritten by commercialism. Recently, NSW raised a concern about the international section of IPL's tournament. If the Blues won the Australian Twenty20 competition, they'd play off against the champions of South Africa, England and India and, in theory, could face Brett Lee bowling for the local Indian team. The IPL competition continues a recent trend whereby players from other countries earn a substantial income from India. Lee recently combined his musical talents with his popularity in India to release a music video with Hindi recording artist Asha Bhosle. An IPL contract looms as lucrative "moonlighting" for international players, but the resultant fame can have unusual drawbacks in India. Once, after a day's commentary in Kochi (formerly Cochin), I decided to go for a swim and was followed from the hotel to the beach by an increasingly large crowd. Thinking I'd get some privacy at the beach, I maintained a relaxed outlook only to discover that when I stripped to my bathers and bounded into the water some locals followed me in, fully clothed. Indian cricket is surfing a tidal wave of money and its officials are obviously familiar with a local saying: "This is a country of the have-lots and the have-nots." The players are the have-lots, while the supporters are the have-nots. Wankhede Stadium in Mumbai is a death trap and the grounds in steamy Kochi and Chennai have concrete seats out in the open. Fans regularly queue in the sun for hours, but many still don't see the first ball bowled. India is a country of extremes. There are street beggars, but personal items in a five-star hotel couldn't be safer if they were in Fort Knox. Rightly proud of such a reputation for honesty, an Indian, incensed by an Englishman's claim at an airport that his luggage had probably been stolen, reprimanded him: "Sir, we may be beggars, but we are not thieves." Indian cricket is also a mass of contradictions. The BCCI continues to rake in the money despite its bumbling and occasionally corrupt ways, while India is the begging bowl from which the ICC acquires its wealth. And here is the BBC's view. I find it interesting according to this reporter the fact that the Indians are receiving quite a lot of support on the call-in radio shows. Indian cricketers victims of injustice? The bus that just would not budge provided the Sydney press corps with the first concrete clue that the Indian cricket tour was in jeopardy. It was parked outside the team hotel in the centre of the city, loaded with luggage and equipment, and scheduled to begin the journey to Canberra, where the Indians were due to play on Friday. This is not the first time, of course, that an Australian coach has been at the centre of an Indian cricketing controversy. As a resident of India at the time, I well remember the burnt effigies of Greg "the guru" Chappell, whose unhappy tenure in charge of the team ended in abject first-round failure at the World Cup in the Caribbean. This motionless coach also hinted of a possible premature departure, not from the kerb but from the country. First, the Indians unloaded their baggage. Then, at a crowded news conference, they unloaded their seething frustrations. They clearly believe they're the victims of two injustices: hapless umpiring, which cost them the game, and a ruling from the match referee Mike Procter which could cost Harbhajan Singh any further involvement in the series. There's little doubt as to the seriousness of the charge: of calling the black Australian all-rounder Andrew Symonds a "monkey", an echo of the ugly chants he received from elements within the crowd when he toured India last October. But in the absence of any incriminating audio evidence, the Indians have called the ruling "blatantly false" and an "unfair slur". Indians reading this might be surprised to learn they have a surprising measure of the support from the Australian cricketing public. Few would defend the bowler's use of a racial slur, but the radio talk shows were full this morning of fans who thought that Ricky Ponting's team had contributed to the unsporting climate in which the incident took place. Sledging has long been a part of the Australian cricketing armoury. The aim is to get in your opponents face. But it's leaving an increasingly unpleasant stench in the nostrils. Many here feel that a certain ugliness has crept into the Australians' play. Asked whether the Australians had taken sledging too far, a snap text message poll on one of the news channels here suggested a 50/50 split - or should that be Fifty50, in the modern short-hand of the game? One would have thought that Andrew Symonds, the wronged-party, would have been the recipient of a wave of sympathy. But many have questioned why he told reporters that he was legitimately caught out in the early stages of his match-winning first innings, but did not "walk" because the umpire failed to raise his finger. Many, if not most, modern-day cricketers would have done the same. But it's talking to reporters about it afterwards, with a hint of glee, which has infringed many Australians' deep-held sense of fair play. Many in the Australia-based Indian diaspora have come forward claiming that Harbhajan is not guilty of a racist slur - and that the controversy is the product of a cultural misunderstanding. "Considering that the Monkey God is one of the revered idols of Hindu mythology and worshipped by millions, it's surprising it was considered a racist term," said Raj Natarajan, the president of the Sydney-based United Indian Association. With respect, that is a complete red herring. Andrew Symonds hated being the target of moronic monkey chants when he toured India in October. Unquestionably, Anil Kumble's side would have known that. My guess is that the tour will eventually go ahead, pretty much as planned. It's vital for these two cricketing super powers, one rich in talent, the other with an abundance of television viewers and the revenues they generate. While there's a great deal of national pride at stake here, there's also a vast amount of money. Well today the press are saying that a canceled tour will cost the Indian's A$2.3 million (for the remaining 2 tests plus one-dayers and that awful Twenty20 lark - which if you ask me should not be included!). Certainly enough reasons there to give it some thought. BBC is reporting that the tour will continue in full. Failure to do so will result in the Australian Cricket Board losing $40m. It did not say whose dollars. here we go, but i think this article should be ICC caves in to India. RIVAL captains Ricky Ponting and Anil Kumble will be told bad behaviour will no longer be tolerated as India yesterday celebrated a major victory and agreed to go back on tour. The International Cricket Council accepted the tourists' demand that controversial umpire Steve Bucknor be sacked from next week's third Test in Perth. The move to replace Bucknor, 61, with New Zealander Billy Bowden came after a day of tense negotiations between the International Cricket Council, Cricket Australia and the Board of Control for Cricket in India. ICC chief executive Malcolm Speed also summoned a peacemaker - the world's chief referee, Ranjan Madugalle of Sri Lanka - to counsel the captains of the two warring teams and to monitor under-siege match referee Mike Procter, who is fighting to save his career. Speed said the negative issues of the Sydney Test had intruded on a great match, and that "over the last week we have seen the best and worst of our game". He added: "We need to seek a way forward and keep the spirit of the game to the forefront, but be careful not to over-react. Cricket evokes passion and emotion." Madugalle will meet Ponting and Kumble in Perth next week with the primary responsibility of ordering both men to settle their differences. The ICC also agreed to India's request to appeal against the three-Test ban handed to Harbhajan Singh for calling Australian Andrew Symonds a "big monkey". Speed said a senior judge from one of 16 countries would be appointed to hear Harbhajan's appeal. Speed was unable to name the judge or the date, but said it would be as soon as possible and Harbhajan would be free to play in Perth if it had not been resolved by the start of the Test next Wednesday. It remains to be seen what the Indians will do if the appeal is lost, but Speed said he believed the rest of the tour would proceed normally. India was expected to leave for Canberra on Monday but has spent the past two days at its Sydney hotel after refusing to leave until the ICC granted Harbhajan's appeal. The tourists have a three-day match against an ACT XI from tomorrow before leaving for Perth on Sunday. The BCCI held an emergency meeting in New Delhi last night to discuss whether the tour would proceed, but CA had been told it was a formality it would go ahead. Bucknor, the world's most experienced umpire, refused to comment last night about his axing, while Proctor was under an ICC gag. Bowden was told of his appointment by the Herald Sun last night. "At this stage I don't know too much. You probably know more than me," he said. As cricket continued to wrestle with one of its biggest crises, Speed denied relations between the two most powerful nations in the game were at breaking point. He said he had replaced Bucknor - clearly guilty of several wrong decisions at the SCG - to try to take some of the tension out of the situation. He said he knew the decision would "cause a lot of different responses", including allegations it amounted to an invitation for any future team dissatisfied with the umpiring to demand the removal of an official. But he denied the governing body had caved in to India. "It is important to stress that Steve has not been replaced due to any representations made by any team or individuals," Speed said. "The ICC remains the sole body responsible for the appointment of umpires and no team has the right to object to any appointment. The decision to replace Steve was made in the best interests of the game and the series." Speed said Bucknor, a veteran of 120 Tests, had agreed with that. Bowden will stand with Pakistani Asad Rauf, who had already been appointed to the Perth match in place of Benson. If India had won the test, or even salvaged a draw, would all this be happening? Sure the umpiring was bad and the Indians got the wrong end of it but they are, in effect, saying that there has been a concerted effort by the Australian cricket team and the umpires to not only beat them at cricket but to attack their national character and humiliate them personally. Let 'em go home if they want (take their bat and ball...), the rest of the series is looking very dodgy now anyway. What happens when part of the aussie crowd starts a "Haberjahn is a wanker" chant or worse still "Haberjahn is a monkey" (though apparently this isn't offensive to Indians). They might be gods in their own country but they are just cricketers here. When they are beaten in Perth and Adelaide they'll no doubt blame someone else....the fact is they couldn't last a full day on a relatively easy (for the last day) SCG wicket, maybe they should "go into the room of mirrors and have a long hard look at themselves" as Roy Slaven would say. ^^ Actually I think it was a victory for common sense. Bucknor deserved to be sacked for his performance. But I hope the 'monkey' appeal is not upheld. That would leave the ICC with no credibility, or effective power. Australia's Brad Hogg has been charged with making an offensive remark to India's Anil Kumble and Mahendra Dhoni as the Sydney Test fallout continues. India's Harbhajan Singh has appealed against his three-match ban for making a racist comment to Andrew Symonds. Now Hogg has been charged with an offence which also falls into category three in the players' code of conduct. If found guilty at the 14 January hearing, he faces a ban of two to four Tests or four to eight one-day games. The 36-year-old was charged after a complaint by India manager Chetan Chauhan. Paragraph 3.3 of the ICC's code of conduct refers to players "using language or gestures that offends, insults, humiliates, intimidates, threatens, disparages or vilifies another person on the basis of that person's race, religion, gender, colour, descent, or national or ethnic origin". Hogg's charge is the latest development in the controversy which has followed the second Test. India had called a halt to the tour but the International Cricket Council say they expect it to resume in time for the third Test in Perth on 16 January. They were furious following the 122-run defeat in Sydney, accusing the hosts of lacking sportsmanship and criticising the umpiring of Steve Bucknor and Mark Benson. West Indian umpire Bucknor has been replaced for the third Test, which begins on 16 January in Perth, by New Zealander Billy Bowden, although the International Cricket Council insisted the change was not made at India's request. What if the umpires got it right in Sydney? 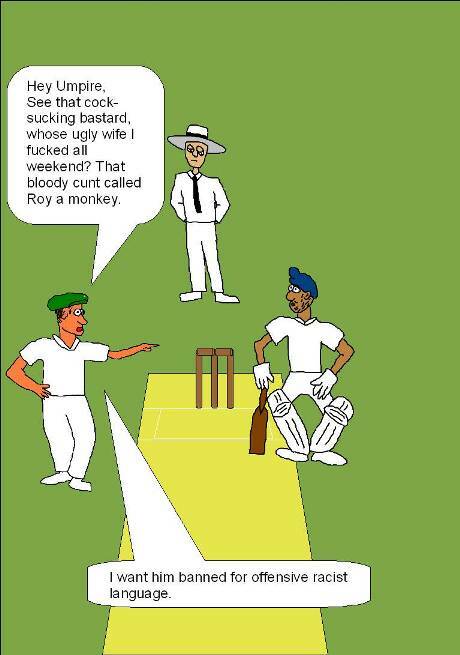 An old tradition is that umpiring mistakes eventually even out so neither side are disadvantaged. This notion has been challenged in the Sydney 2nd Test where India was on the rough end of an unfair share of dodgy decisions. Like many cricket fans, I'm a statistical nerd who delights in calculating averages, plotting graphs and playing with numbers. So I thought I'd try a simplistic simulation of how the 2nd Test might've progressed if the umpires had got it right. I've made two assumptions in my "simulation". If a batsman was given not out when they were out, I subtract their score at the time of the not out from their final score. There are other complicating factors like partnerships they had that I've had to ignore - maybe if I had a supercomputer and a helluva lot more time on my hands, I'd simulate that too. The other assumption is for batsmen given out when they were not out, I assume they would've scored their Test batting average. Andrew Symonds was given not out on 31 when he nicked through to the keeper - he went on to score 162. Similarly, Ricky Ponting glanced to Dhoni on 17 but was reprieved - he went on to 55. These two umpiring errors cost India 170 runs. Australia should've made a first innings total of 293 which would've ended late on Day 1. Laxman survived an LBW shout on 12 then went on to score 109 - TV replays showed he was out. Tendulkar survived an LBW shout on 36 that was also out - he went on to 154. Alternatively, Wasim Jaffer was bowled off a Brett Lee no-ball for 3 - his batting average is 36. So umpiring errors cost Australia 189 runs. India's 1st innings total should've been 343 and would've ended sometime on Day 3 before lunch. This gives them a first innings lead of 50 runs - not dissimilar to the 69 run lead they actually enjoyed. Mike Hussey was given not out around 20 in the 2nd innings and went on to make 145 not out. This cost India 125 runs. The batsmen left were Brett Lee (average 21), Mitchell Johnson (who has an inflated batting average of 43 due to not outs so I'll go with his average per innings of 21) and Stuart Clark (average 13). So Australia should've made a 2nd innings total of 331, ending on Day 4 around lunch time. Dravid was given caught behind on 38 with his bat tucked safely behind his pad. Dravid's average is 56. Ganguly was given caught by Michael Clarke for 51 where he may have grassed the ball and thus receive benefit of the doubt. But Ganguly's average is 44 so according to my system, this doesn't add any runs to India's total. I also ignore that Gilchrist threw his wicket away slogging for a declaration which wouldn't have been the case in this simulation. So India's total goes from 210 to 228, finishing early Day 5. The final result after removing umpire error - Australia wins by 53 runs with 2 sessions to spare. The notion that umpiring errors prevented India from saving the Test looks very unlikely. The match never would've reached the last session of Day 5 - one team would've won outright. But who? India have problems with Wassim Jaffer, Yuvraj Singh and Mahendra Dhoni who have made no impact with the bat. Similarly, Rahul Dravid is scoring so slowly, even if he lasts for hours, he rarely hurts the Australians. Sluggish fielding and running between wickets cost India many runs throughout a Test - possibly as much as the winning margin. Brad Hogg needs to learn how to take Test wickets. On the SCG 4th and 5th pitch, Harbhajan, Kumble, Symonds and Clarke were bowling hand grenades. Hogg was dibbly dobbly man. Unless Shane Warne comes out of retirement, Australia's spin prospects are bleak. One thing you can be sure of - Australia will be working hard on these problems between now and the 3rd Test. If India adopt the mindset that umpiring robbed them in Sydney, they'll fail to thoroughly address the other issues within their control that contributed to their defeat. And that would play into Australia's hands.